The shop is now open and is housed in a lovely log cabin that we built ourselves during the winter of 2017/18. It's twin-walled so benefits from insulation between those walls and also under the floor and in the roof too so will be a pleasure to visit all year round. As soon as you arrive at the nursery the shop is on your left so you won't miss it. Previously we only had the polytunnels to keep stock in and product either got too damp from the moisture in the air or the packaging faded from the sunlight through the plastic. Now being able to keep things warm and dry we can really expand on the products we sell here at the nursery. We've also moved the till from the polytunnel to the shop so if you can't find us out in the display area or in the polytunnels, we'll be in there! We like to have as wide a variety of products on sale here at Madley Plants from garden essentials such as tying wire, tree ties, vine ties and plant labels right through to wonderful watering cans and gifts for gardeners. We also have some gorgeous garden twines, pruners, loppers, plant food, child and pet safe garden care products, spades, forks as well as hosepipes and associated accessories. 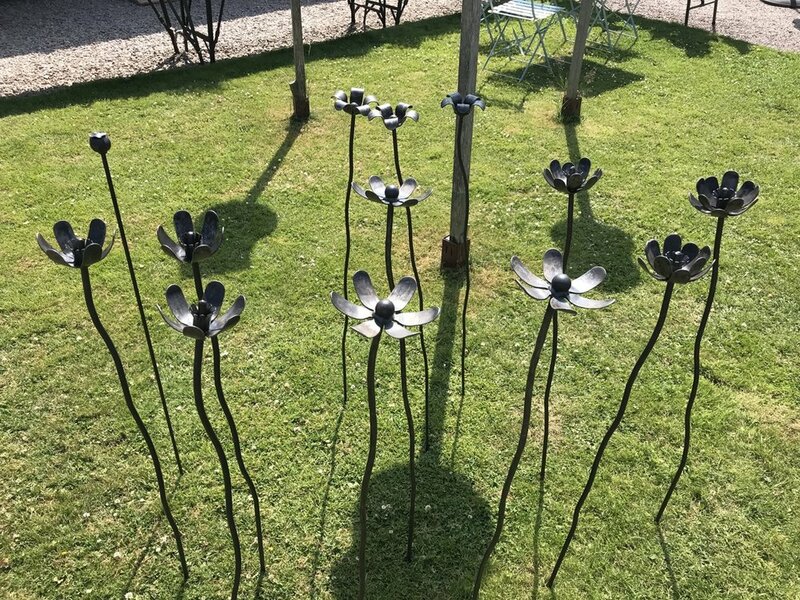 We also sell these beautiful steel flowers handmade by a very talented chap from Monmouth. 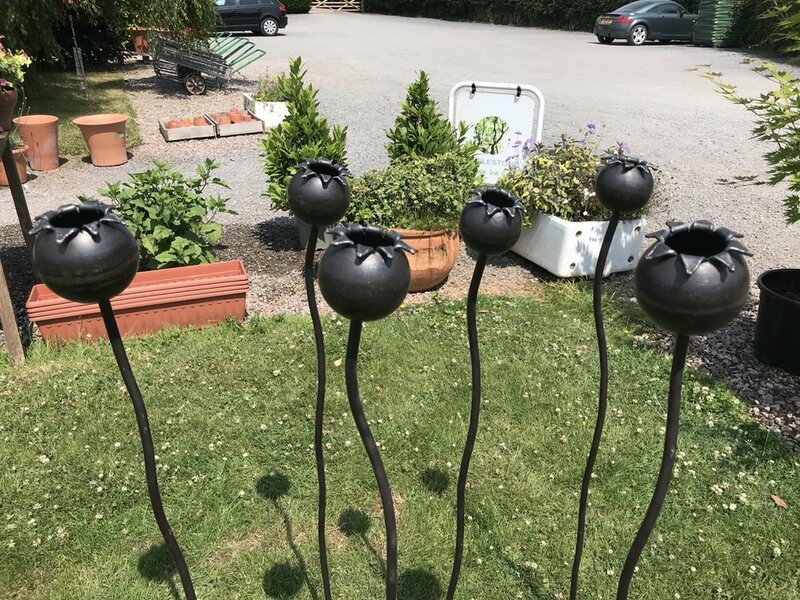 There's a variety of flowers, poppy heads and plant stakes to choose from and with prices starting at just £10, these are well worth a look. Our suppliers include household names such as Hozelock, Spear and Jackson, Haws, Nutscene and Fiskars as well as some lesser known, but equally respectable suppliers such as Ecofective, Darlac and PlantGrow. Seasonally, we will also be looking to stock hand made products sourced as locally to here as possible. We've linked to the suppliers above so click on the brand and take a look for yourself. We're also very pleased to be retailers of Certainly Wood's fantastic kiln dried logs, kindling and flamers, their natural firelighters. All products are equally good for fires in the winter as they are for BBQs, fire pits and outside ovens in the warmer months. We now stock these guys' pure hardwood charcoal too - in both 3 and 6kg bags. Birchwood Forestry create sustainable pure hardwood charcoal from SSSI (Site of Special Scientific Interest) woodland, made with love and passion in the heart of Herefordshire. Their charcoal is not only chemical free but won't taint food and is very easy to light. A new arrival in the shop are Beebombs…these wildflower seedballs are handmade in Dorset from local clay and sifted top soil and are packed with a wide range of native wildflower seeds. They require no gardening skill and can be scattered straight onto open ground at any time of the year. Each pack can cover over 20 sq ft of ground which can create a wonderful habitat for both bees and butterflies. These are available for spending here at Madley Plants, in either the nursery or the shop, and come in £10, £15, £20 and £25 values. We’re open 7 days a week, from 9-5 Monday to Saturday and 10-4 on Sunday.